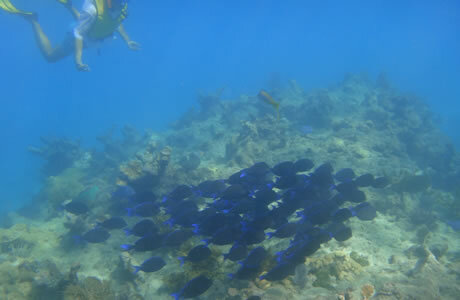 The Sambo Reefs are divided into the Western, Eastern, and Middle Sambo Reefs, and represent some of the Florida Keys' most popular diving and snorkeling areas. The divisions between the reefs are white sands. You'll find them four miles south of the Boca Chica Channel. They are marked by a pole at the eastern end of Western Sambo and buoy #2. Part of the Sambo Reefs comprises a Sanctuary Preservation Area—you may dive this area but must observe careful restrictions. You may not for example take anything from the site including fish and lobster. You may hunt for fish or lobster in the nonprotected areas of the reefs however, and also look for shellfish. The inland grass bed is particularly good for shelling. Another no-take zone is marked out as an Ecological Reserve of nine square nautical miles, located between the Boca Chica shoreline and Western Sambo. There is plenty to see in the Sambo Reefs, including in the preservation areas. The area is home to diverse species of marine life including fields of branching coral which extend as far as the eye can see and numerous types of fish, shellfish, lobsters, and more. Keep in mind that you cannot take shells (even empty ones) from the preservation areas—these areas are to remain entirely undisturbed so that the species of life in those areas may go on about their lives. The depth in most areas ranges from 24-40 feet, making this a great site for beginners, but also a rewarding one for more advanced divers. You may also choose to snorkel this area without diving. You'll still be able to see many species of sea life and exciting underwater features, even if you stay around the surface of the water. The average depth is just 25 feet, with some areas even shallower than that.